What is God up to in Germany? It was a rainy Sunday morning early September when I approached the church doors of Augustinuskirche in my hometown of Schwabisch Gmund, Germany. It had been more than half a century since I had been in the church. The double oak doors felt just as heavy as they had when my schoolmates and I pushed them open to attend services. It was our Thursday morning ritual before we walked together to class at our elementary school. In those days, Christian teaching in public schools was customary. Today it is a disputed topic. According to The Economist the debate is over whether religious teaching fosters or hinders tolerance, as more than half the public-school students are Muslim, and Islam is the second largest religion in Germany today. To be totally accurate this visit to my childhood church was my second one while I was in my hometown this year. The Sunday prior I had found the church doors locked. Church membership in Germany has declined, especially since reunification with East Germany in 1990. 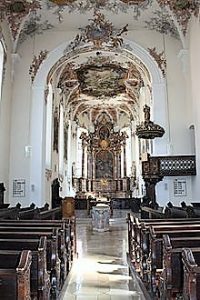 Religion in the former communist East Germany was frowned upon, and today those states still have the largest population of unchurched residents. Christianity is still the largest religion in Germany, even at a low of 55%, compared to that of the US at 83% according to an ABC News poll. Catholic and Protestant churches have an equal share in this percentage. Laws originating in the 19th Century require all Germans officially registered as Catholics, Protestants or Jews to pay a church tax of 8% to 9%. Today some politicians are calling for that tax to extend to German Muslims, thus barring foreign investments from Muslim countries. Church tax is collected by the German government and deducted from workers’ pay or pensions. All those baptized are automatically counted as church members, if they attend a church or not, unless they file an official declaration renouncing that membership. A Gallop poll puts church attendance at 13%, compared to 47% in the US. Considering these statistics, I should not have been surprised to find the Augustinuskirche church doors locked at my first visit. With not enough churchgoers to support weekly services, pastors rotate among several churches. On the day I attended, there were many empty seats. Most of the congregants were senior citizens. What a change from my childhood experience of a packed church resounding with the voices of the young. But I remain positive. And curious, too. What is God up to in Germany? In the last years, more than a million refugees from all over the world streamed across German borders. Today one in 80 people in Germany is a refugee! The mission Christ gave his followers was to go out and proclaim his message of salvation to other nations. 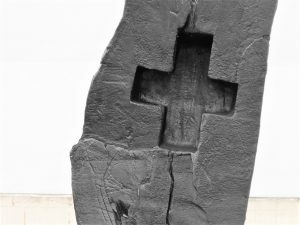 Now that those nations have come to them, will the German Christian churches see this as God’s curse or promise? God is certainly up to something in Germany. Augustinuskirche, Schwabisch Gmund, Germany was built in the 13th or 14th Century as an Augustine monastery and became a Protestant church in 1817. It was originally built in the gothic style and after a partial demolition rebuilt in the baroque style. Frescoes inside the church illustrate scenes from the life of St. Augustin. The baroque high altar was built in 1770. 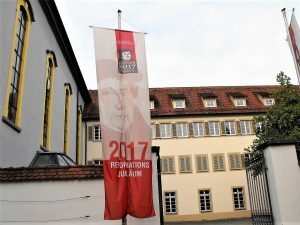 A banner with the image of Martin Luther at Augustinuskirche proclaims the “2017 Reformation Jubilaum” the 500th anniversary of the Reformation. 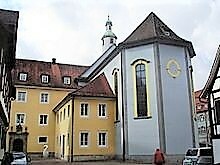 Adjacent to the church is the former Augustinian monastery, which houses the Protestant parish church as well as the financial offices of the city of Schwabisch Gmund. 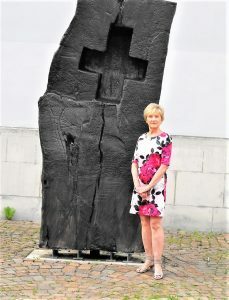 Irma Fritz in front of a unique sculpture of a cross carved into Basalt rock at Augustinuskirche.